In recent years online traffic between Black Friday and Cyber Monday has increased up to 220% on daily averages, indicating consumers both expect and seek out 'Black Friday' themed deals and sales. 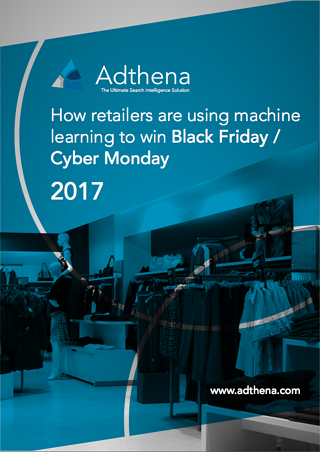 Adthena's latest report explores how increasingly, a machine learned approach is making the difference for the brands employing winning strategies on Black Friday. The report covers the Fashion, Home Retail and E-commerce verticals, and includes a retail case study from 2016. How retailers can use the 'Whole Market View' to gain a competitive advantage in paid search. Tackling challenges of scale by using machine learning to refine data and uncover insights. The importance of competitive intelligence in identifying opportunities and informing decision making. How River Island leveraged real-time data and market intelligence to secure a 82% uplift in sales during Black Friday 2016. To download the report, please complete the form on the right.